The Royal Oak Concept Laptimer Michael Schumacher is a special treat for lovers of innovative watches. With this watch, you can both time and save lap times. Its development was initiated by the most successful Formula 1 driver in history. The cooperation between Michael Schumacher and the Swiss manufacturer Audemars Piguet (AP) began in 2010 and has resulted in two watches. Previously, Schumacher had worked together with the luxury watch manufacturer Omega. That partnership led to the creation of a special edition of the legendary Speedmaster. In 2010, after a four-year hiatus from Formula 1 racing, Schumacher switched from Ferrari to Mercedes and made his comeback as a driver at the top of sports racing. Around this time, he also became a brand ambassador for Audemars Piguet. In 2012, the manufacturer presented the first watch in honor of this partnership, the Royal Oak Offshore Chronograph Michael Schumacher. This limited edition series was comprised of 1,000 titanium models, 500 pink gold models, and 100 platinum models. All of the timepieces sold out quickly. The second watch premiered in 2015, the Royal Oak Concept Laptimer Michael Schumacher. In December 2013, Michael Schumacher was in a serious ski accident. Since then, his condition has been kept under wraps. He had begun developing the Laptimer watch prior to the accident and was in constant contact with watchmakers, tracking the progress of their work. With the Schumacher family's blessing, Audemars Piguet kept developing the watch after the accident. When the Royal Oak Concept Laptimer Michael Schumacher was finally introduced after five years of development, it resonated strongly with watch enthusiasts. Audemars Piguet broke new ground with this watch. The Royal Oak is an enhancement of the double chronograph, which has two stopwatch hands. Its most notable innovation is that it can finish timing a lap while beginning to time the next . What's more, you only have to press a single button. 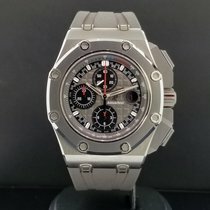 Which Michael Schumacher chronograph should I buy? How much does an Audemars Piguet Michael Schumacher cost? If you want to own one of the most unusual chronographs in the world, then the Royal Oak Concept Laptimer Michael Schumacher (reference number 26221) is a good choice. 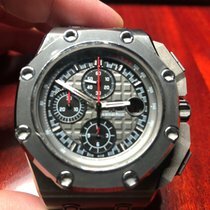 The newer of the two Michael Schumacher watches from AP is limited to a run of 221 and is thus very difficult to get one's hands on. It was limited to 221 timepieces in honor of Schumacher's points finishes during his Formula 1 racing career. You should be prepared to spend around 232,000 USD if you want to purchase a Concept Laptimer. Some new models cost up to 267,000 USD, and the original list price was 277,000 USD. The timepiece follows the trend of large wristwatches. The 44-mm case is made of carbon and is 19.3 mm thick. The case back has a sapphire glass window with a titanium frame. The watch's most unique feature is its refined lap timing mechanism. It combines the qualities of a double and flyback chronograph. Two central stopwatch hands are a characteristic feature of the Laptimer Chronograph. It's water resistant to 50 m (5 bar, 164 ft). The older Royal Oak Offshore Chronograph Michael Schumacher is available at lower prices. The entry-level price for the titanium version is around 63,900 USD – still a stately sum. When the watch was released in 2012, the titanium version only cost 45,300 USD. The rose gold version, which originally sold for 78,900 USD, now sells for around 104,000 USD. The platinum version increased in value as well, rising from 123,000 USD to around 151,000 USD. You can dive up to 100 m (10 bar, 328 ft) with the Royal Oak Offshore Chronograph. The case has a diameter of 44 mm and is 14.25 mm thick. One important extra feature of the Concept Laptimer is its third push-piece on the left side of the case across from the crown. You can use this push-piece to stop the first chronograph hand and reset and start the second hand again. The Laptimer and its special functions are especially interesting for hobby racers. However, experts admit that the watches won't necessarily play much of a role in professional racing. Laps aren't timed by drivers sitting in the cockpit with a mechanical watch, but rather with electronic timing devices. Modern timing technology uses transponders and induction loops and is accurate to 0.001 seconds. There is no way a wristwatch can compete with that. The Concept Laptimer's movement is unusual in that it's manual. However, it doesn't need to be wound very often: The caliber AP 2923 has an 80-hour power reserve. It has 413 individual pieces, 34 jewel bearings, and a frequency of 28,800 alternations per hour (4 Hz). In addition to the stopwatch hands, there is a 30-second counter on a subdial at 3 o'clock. You can also view the movement through the watch's skeletonized dial. The automatic caliber 3126/3840 powers the Royal Oak Offshore Chronograph. This caliber is comprised of 365 pieces and is based on the caliber 3120, with an additional chronograph module from Dubois Dépraz. The 3126/3840 has a power reserve of around 50 hours, and it vibrates at a frequency of 21,600 alternations per hour (3 Hz). Michael Schumacher's signature is engraved on the golden rotor. Both Schumacher watches have an octagonal, high-tech, and futuristic look. They're particularly appealing to watch enthusiasts who are also fans of Hublot and their porthole design. Gérald Genta designed the first two watches of this type, the Royal Oak and Patek Philippe's Nautilus. Also, both the Michael Schumacher watches and Hublot watches use rubber straps. If you're not sure whether you have a Royal Oak Offshore Chronograph or a Concept Laptimer in front of you, the screws on the bezel are a good place to look. The Concept Laptimer features slotted screws, as seen on the standard Royal Oak. However, the unusual hexagonal socket screws are a sure sign of the Royal Oak Offshore Chronograph. These eight screws keep the wide bezel attached to the case, giving the watch its characteristic porthole look. The bezel is made of cermet, a special alloy that is a mixture of ceramic and metal and is significantly harder and thus more scratch resistant than steel. The edge of the dial serves as a tachymeter scale. Seven small stars are located at the upper right part of the scale, representing Schumacher's seven Formula 1 titles. Two blue stars represent his wins with Benneton, while five red stars stand for those with Ferrari. The hands on the subdials at 6, 9, and 12 o'clock are red, and there's a date display at 3 o'clock.